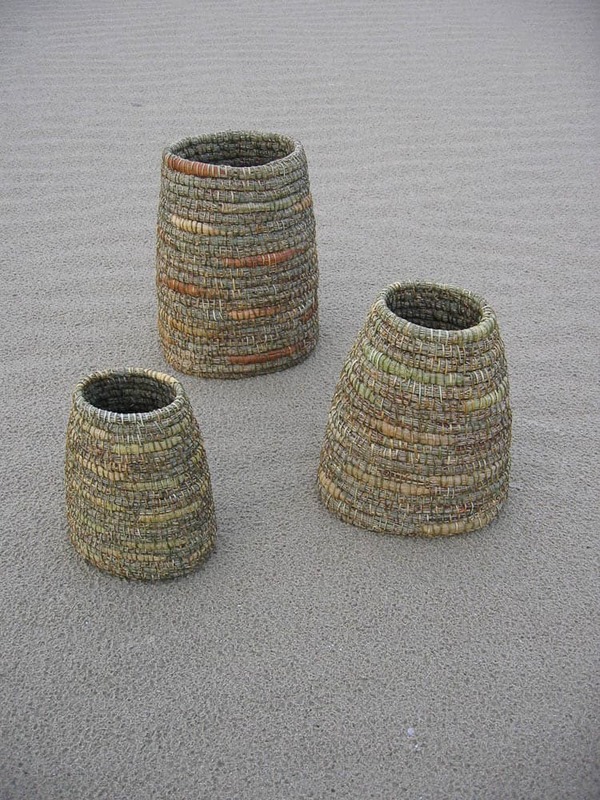 In the third article about contemporary fibre artists, we venture south to explore the world of Gwen Egg. 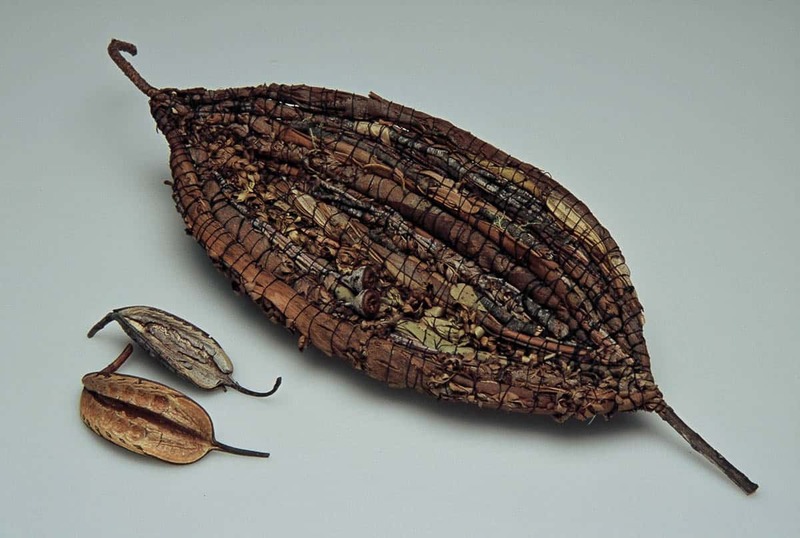 Egg’s life in fibre testifies to its power as a medium for binding the land with its peoples. The bus trundles along the convict-built Sorell causeway straddling Pittwater and Orielton Lagoon east of Hobart. The still water reflects the mauve sky so perfectly it seems the world might be upside down. 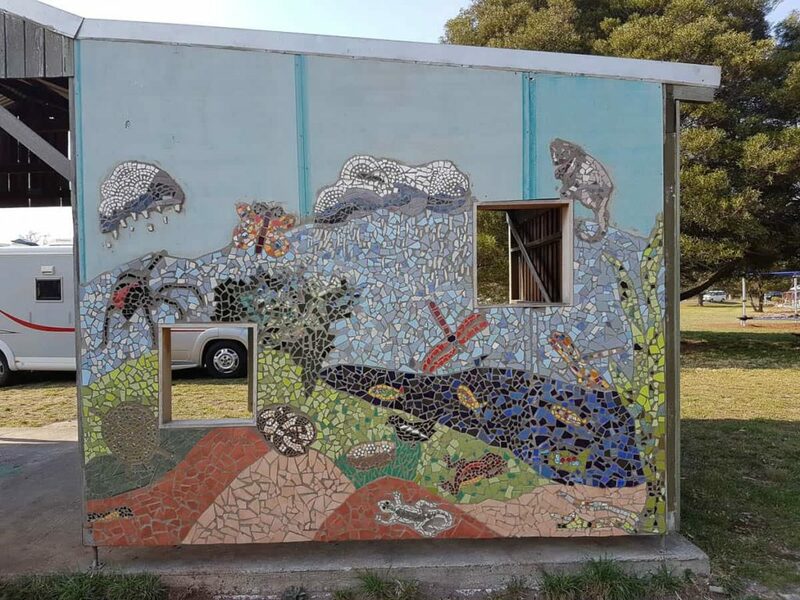 I get off at Dodges Ferry Primary School and pass a parade of mosaics. School wall, bus shelter, picnic space, garden wall—every man made vertical space is covered by bucolic scenes of land and sea. I meander through a grass labyrinth to the beach. It’s 27 degrees in late April at the bottom of the world. During the endless summer of 2017 casts an unreal glow across southern Tasmania. 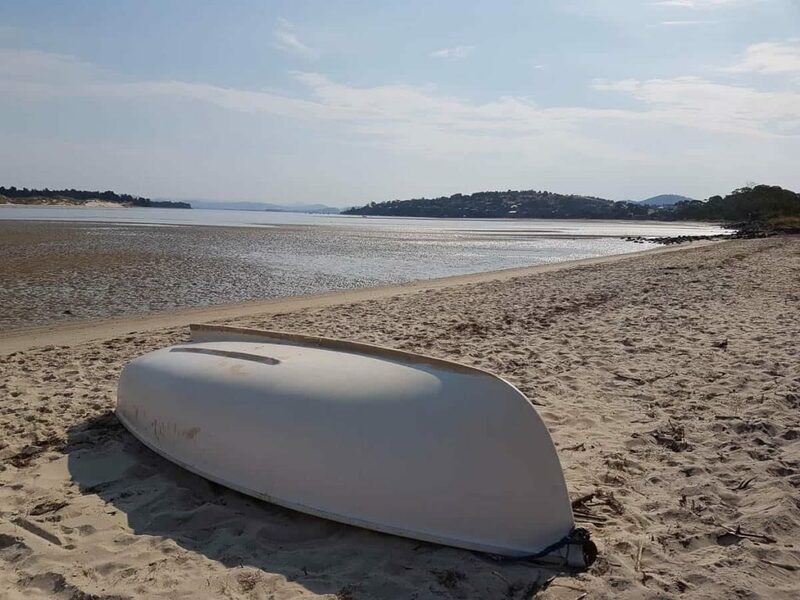 The perfect stillness of Tiger Head Bay carries voices from across the water, black dots sounding as though they are standing next to you, mixed with the piping calls of oystercatchers. 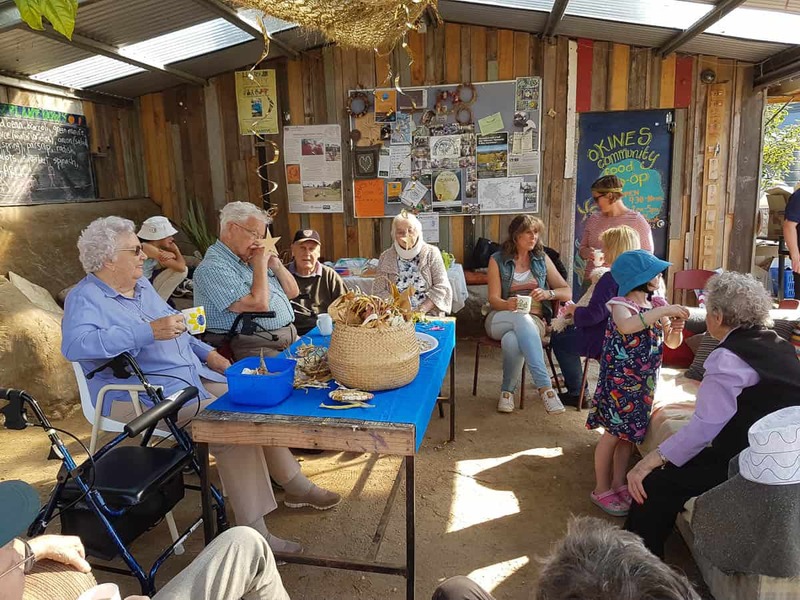 I eventually make my way to the Okines Community Garden, where a group of nonagenarians are gathered around a table, along with community workers and volunteers. 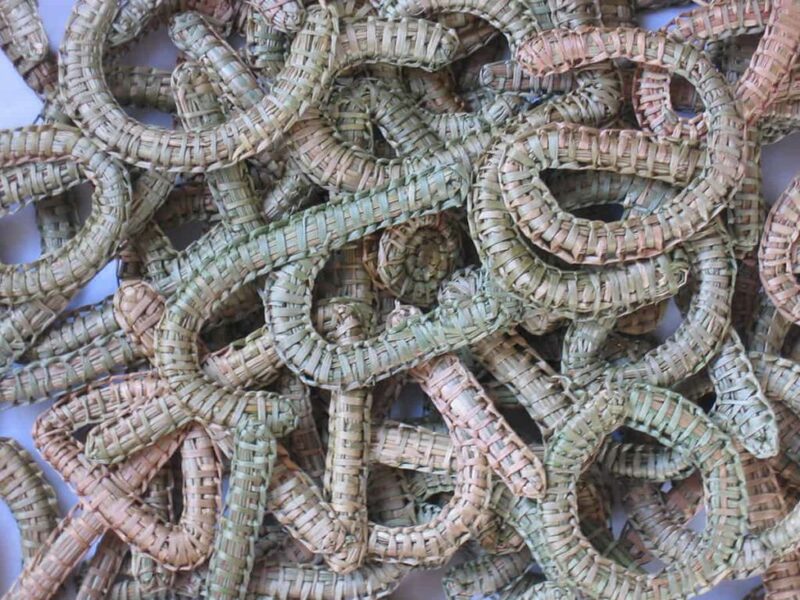 The table is strewn with corn husks salvaged after the cob was eaten and then dyed ready for weaving. A rosy-cheeked volunteer tells me that today’s activity is DIGnity, a local initiative offering supported gardening in a community setting. Residents of a nursing home are invited into a space on “uneven ground”. 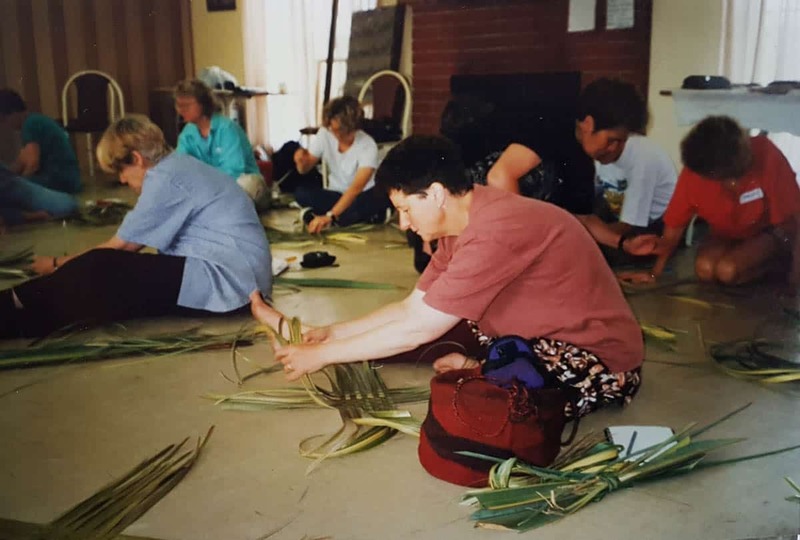 They are encouraged to participate in gardening activities or try out simple fibre techniques as a way of stimulating their senses and gaining respite from institutionalisation. I spy in the background a demure figure sorting through plant fibres. 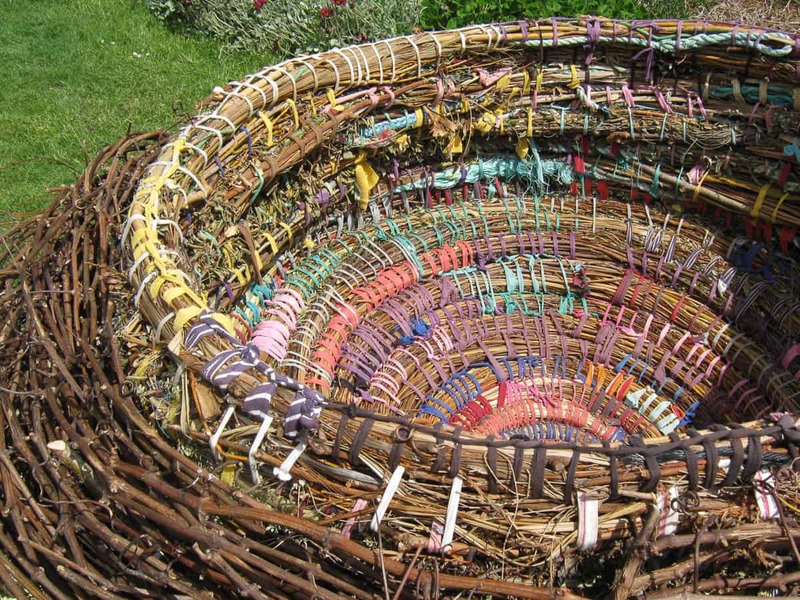 Local fibre artist Gwen Egg has been creatively engaged in community activities and community arts through most of her life. In recent years, she has been involved in several projects with community gardens. 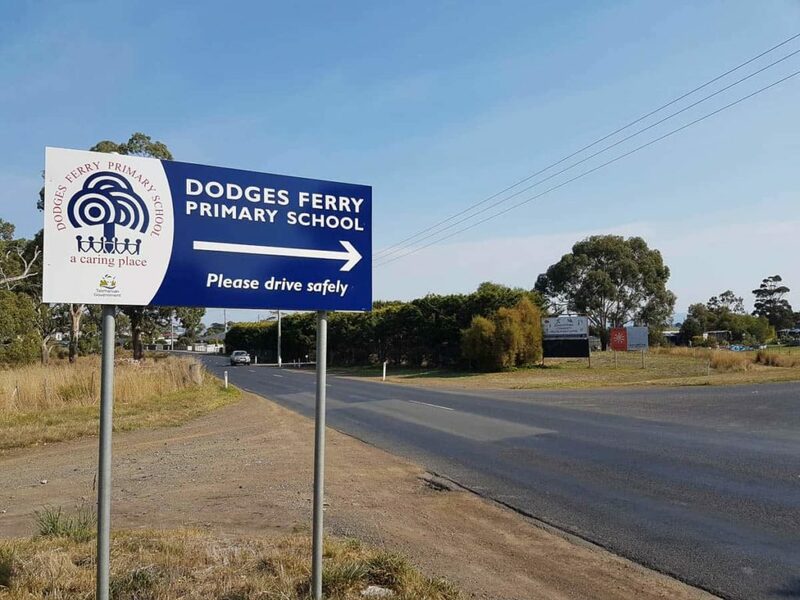 Walking Each Other Home is a local project aimed at building the capacity of the Dodges Ferry community to support each other and help counter the isolation of those dealing with grief or in palliative care. While the conversation is permitted to lead to mortal concerns, the making activity also allows for healing silences. 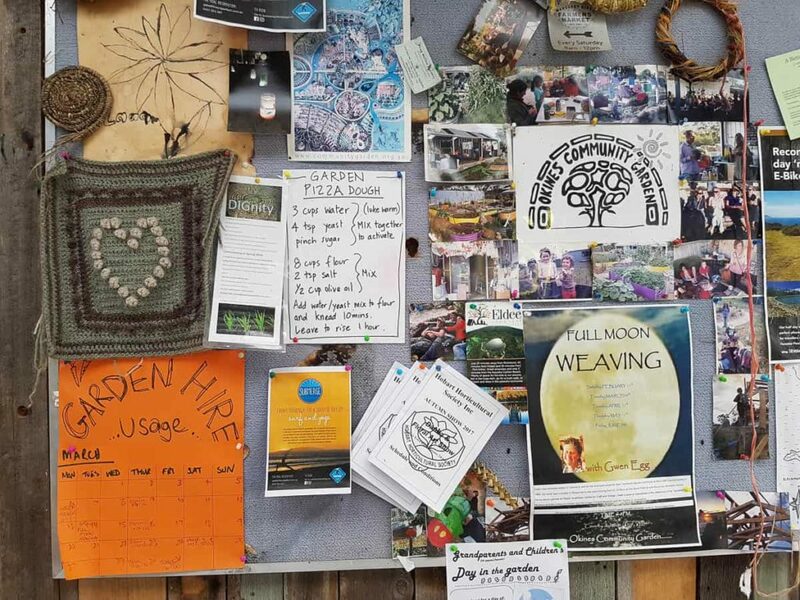 Out of this developed Full Moon Weaving workshops, where once a month, Gwen curates a fibre activity in the garden shed for anyone who turns up on the night to learn a technique or find some company. 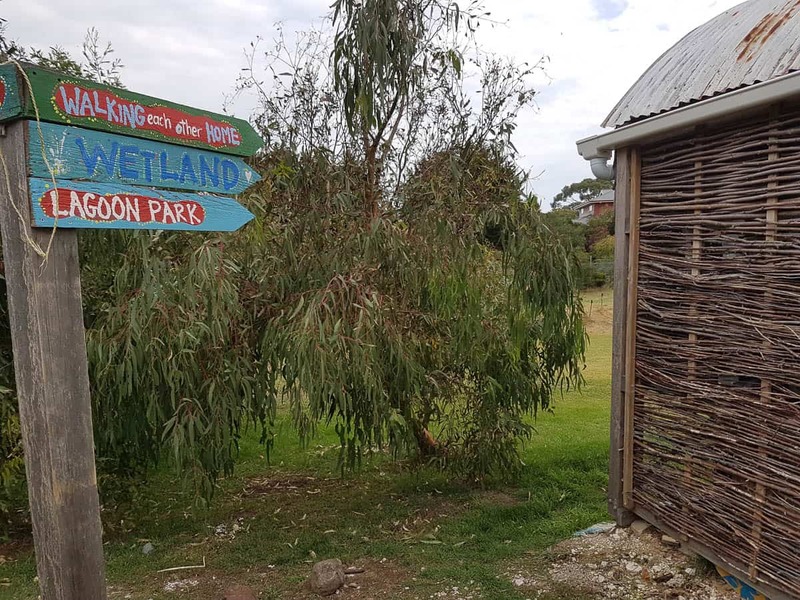 Next workshop participants will weave with autumn prunings from the garden and cumbungi weeded from the nearby coastal wetland. While exhibition work is an essential part of her practice, teaching and community arts offer a secure hourly rate rather the uncertainty of gallery sales. 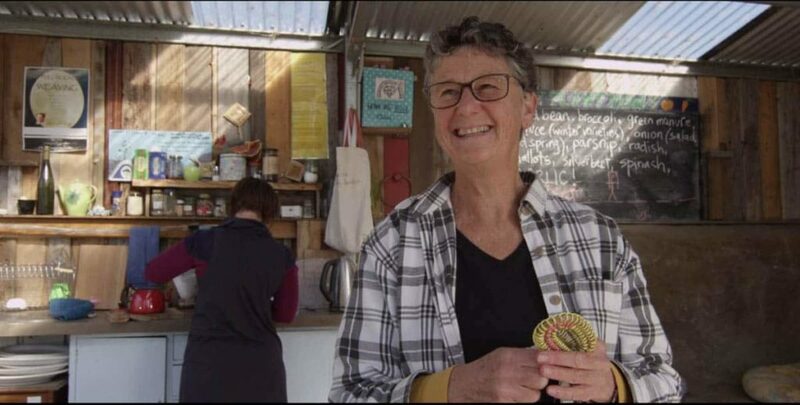 Her environmental work through Southern Beaches Coastcare in Tasmania’s south has been officially recognised: she was Tasmania’s Local Hero in the 2013 Australian of the Year awards. But the division between community and artistic practice is blurred for Egg. Understanding the broader framework of her life helps us appreciate the unique power of her art. In part, it’s a settler story. Her great- great- grandfather, the Rev. 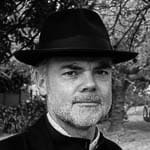 George Taplan, established the Port McLeay mission on the Coorong, now Raukkan, in South Australia. Three generations of her family lived worked and died or were born and raised on the mission. Relationships with Aboriginal people and organisations have continued to be important to Egg and other members of her family. Her father mentored Australia’s first Aboriginal parliamentarian, Neville Bonner, while involved in the OPAL (One People of Australia League) movement. His practical skills were legendary, even smuggling tools into his retirement village where he did odd jobs until his death at 101 years. Gwen moved from Queensland to Tasmania with her family as a teenager. She studied Psychology at UTAS and Urban Planning at the TCAE, worked as a researcher and statistician, but never stopped tinkering in arts and crafts. 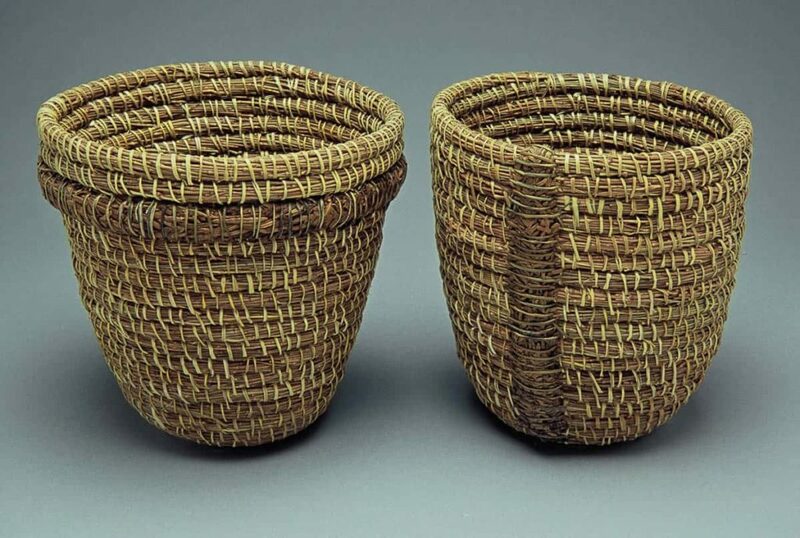 This led to a job working with young women, where she discovered the usefulness of teaching craft techniques such as basketry and arranged a class with Anne Piesse. By 30, she felt the urge to mastery: “I wanted to be good at something”. Egg studied screen-printing at TAFE, but was drawn to basketry. Gwen Egg soon became drawn into the emerging Australian fibre scene. Her association with Anne Piesse led to inclusion in the exhibition New Tasmanian Baskets (1985) initiated by the Crafts Council of Tasmania. It was an exciting time for fibre art. The visit of the US artist Douglas Fuchs in 1981 had introduced the possibility of gallery installation for fibre arts and inspired experimentation. Egg met Ruth Hadlow at a Tasmanian basket weavers’ gathering in the early ‘90s. With Jennie Gorringe, then manager of the Moonah Arts Centre, they developed a lively program of fibre and textile workshops which included bringing to Tasmania West Australian fibre artist Nalda Searles, Maori weavers Tina Wirihana, Mate Lawless and Tilly Mathews and Ngarrindjeri artist Yvonne Koolmatree. 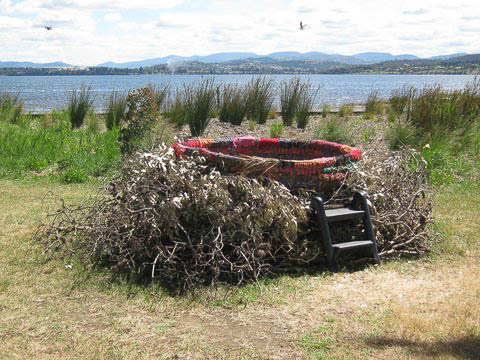 When she first began basket weaving, Egg was curious about the Indigenous Tasmanian craft. 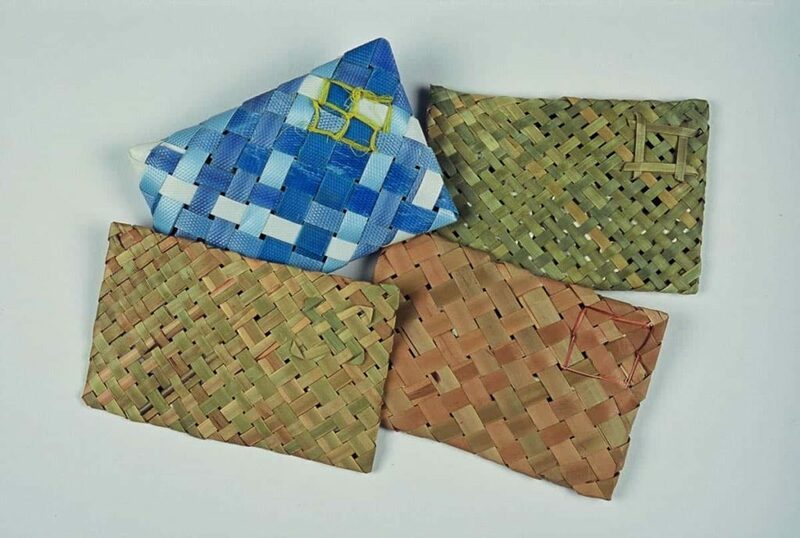 She studied closely the Tasmanian Aboriginal baskets currently in museum collections and attempted to gain an understanding of their construction. 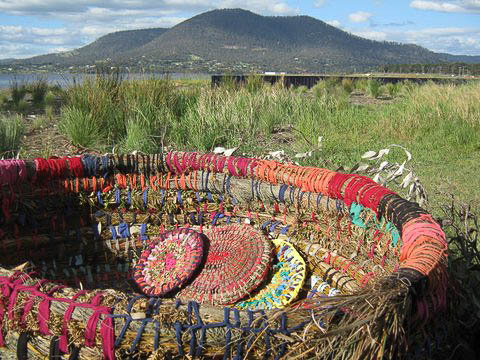 Jennie Gorringe organised a fibre camp where Egg shared what she had learned with local Tasmanian Aboriginal weavers like Eva Richardson, who commented, “it was the sharing of Egg’s knowledge and skills at this camp that has led to the reclamation of the Tasmanian fibre arts.” As this skill was revived, Gwen felt it was important for her then to step back from reproducing the traditional forms and investigate her own traditions and pre-occupations. In 2009, Egg took a residency at Maatsuyker Island lighthouse, where she was completely isolated and immersed in nature. In 2010, she was approached by Glen Murray to make giant nests for a production by MADE (Mature Artists Dance Experience) around the theme of “refuge”. These fibre nests were up to 2.4 metres in diameter and offered fresh technical challenges. This led to further nest building, such a public art project for GASP! 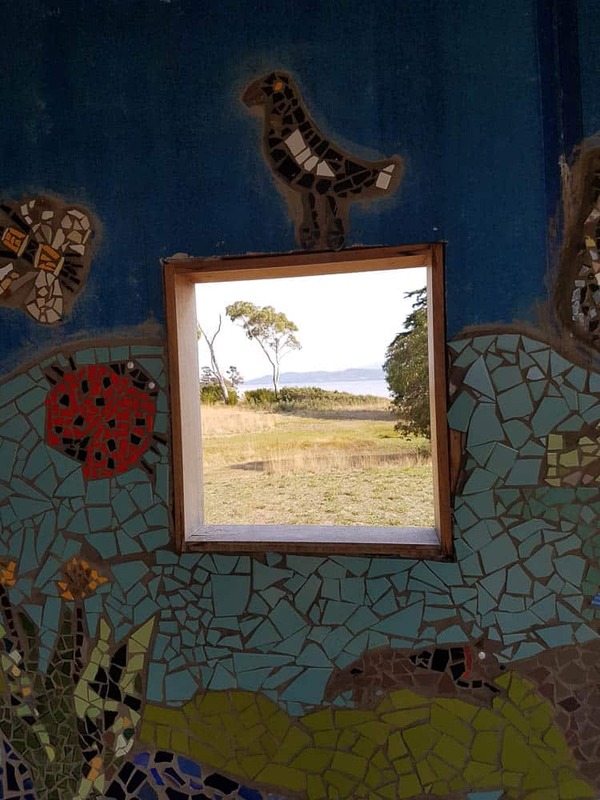 (Glenorchy Art and Sculpture Park), community projects on King Island for 10 Days on the Island, and a nest building project for the Bruny Island Bird Festival. 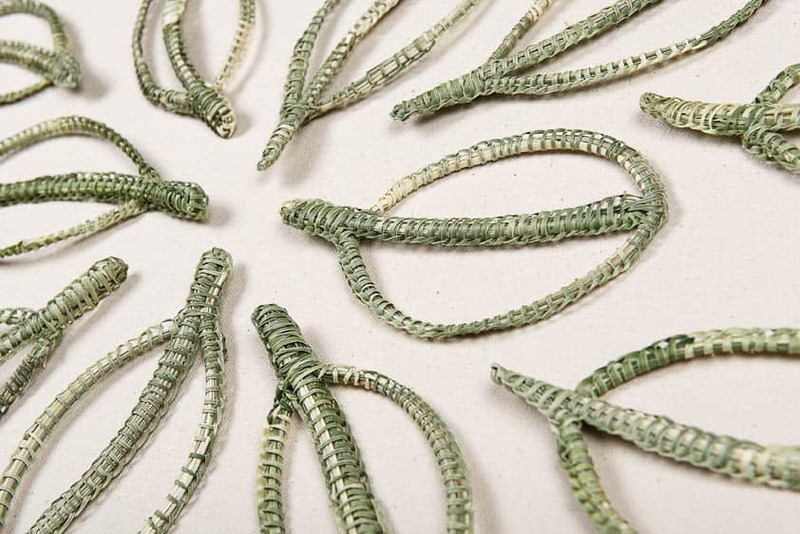 In 2016 she shared a residency on Maria Island with Tanya Maxwell and worked with Ghost Net weavers from the Torres Strait brought to Tasmania by Tasmania Regional Arts for the Waterlines project at TMAG. Her work for the second Tamworth Textile Triennial further developed woven alphabets into discrete shapes, related to nest building. Gwen Egg’s life demonstrates the power of fibre as a medium for art and life. Speaking her “language” of fibre enables us to communicate with each other, share unique moments, hold together silences and make contact with ancestors. As a settler artist, Egg is particularly engaged with the transmission of this language across the continent and its islands. These “string lines” offer a way of thinking about our land that both acknowledges traditional ownership as well as the role of the settler/missionary in transmitting skills. The death of Australia’s Great Barrier Reef heralds a growing disconnection from nature due to climate change. This occurs at a time of increased interest in formal recognition of Indigenous Australia. 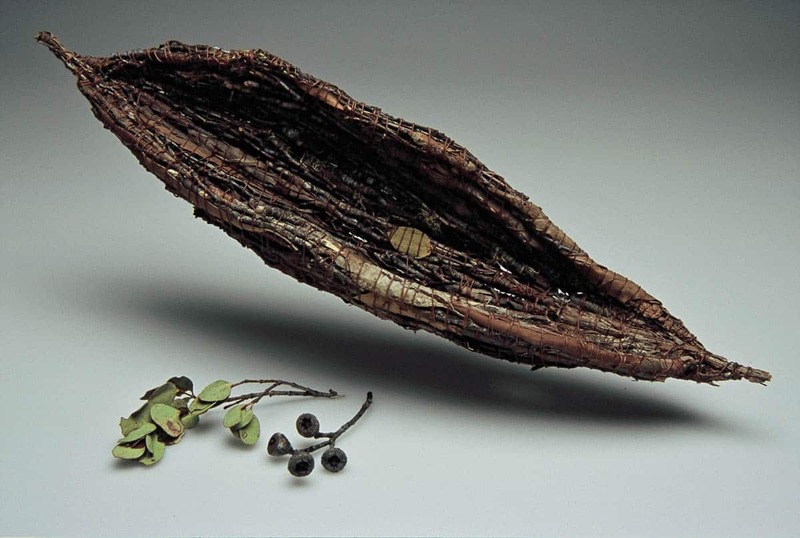 An artist like Gwen Egg provides an example of how fibre might provide a means of responsibility and care for both the land and its peoples. Distant voices may yet be heard. I recall the wonderful camp we had at Fortesque Bay in Tassie , freezing cold an dGwen encouraged us all to swim in th along strands of kelp waftein aground the coastal rocks.. a special experience.. plus we did weaving toll we were satiated..
Gwen Egg was one of my mentors through an Australia Council mentoring program, through her encouragement to explore place and express this through fibre art I developed a fluidity to my work. She was instrumental in making me the artist I am today! Gwen kindly gave permission for me to include one of her poems in my book ‘Second Skin’. An artist and writer for whom I have great respect. I enjoyed meeting Gwen at Grampians Texture last week where she generously talked with me for an hour and a half about her beautiful nests. Thanks Gwen!